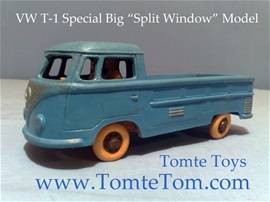 "Split Window" - "Splittie" - "Bulli" - "Bakkie" - "Ute"
NB! BIG Model - Ca. 9 1/2 Inch"
- Great Blue version with orange Driver and The Junior Helping Boy - beside him in the front seat! 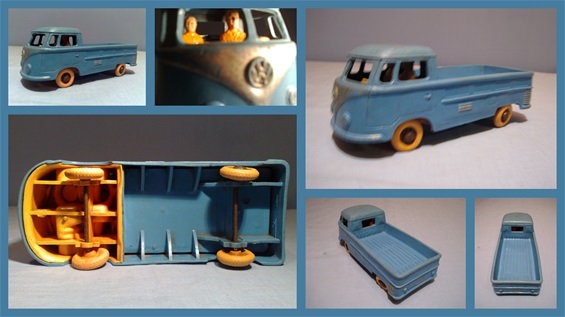 Great details on this model! This one - blue body and orange interior! Check underneath to see details! 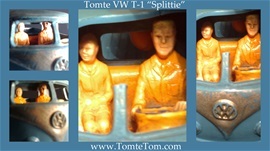 "TOMTE TOYS" - "STAVANGER - NORWAY"
Tyres with ventilated and chromed Hub-Caps! Silverpainted V-Front, headlights, bumper and sidebars! Bite-marks, painted, named and other secondary markings are usual! Some where used heavily and played a lot with! Great Model Toys made for Children for long time use and fun!